Thomas H. Davenport is the President’s Distinguished Professor in Management and Information Technology at Babson College, the cofounder of the International Institute for Analytics, a fellow of the MIT Initiative on the Digital Economy, and a senior advisor to Deloitte Analytics. He teaches analytics and big data in executive programs at Babson, Harvard Business School, MIT Sloan School, and Boston University, and is the author or coauthor of seventeen books. Julia Kirby is a senior editor at Harvard University Press and a contributing editor for Harvard Business Review. She is the coauthor of Standing on the Sun: How the Explosion of Capitalism Abroad Will Change Business Everywhere. A fine call to action in the face of uncertainty. The world the authors describe may be unsettling, but it is a world that we would all recognize and will likely live to see. This badly needed and well-researched book makes a convincing and inspiring case that the challenges ahead could be a catalyst to help us achieve far more of our potential and, in the process, become much more human. It is a powerful call to action and provides a roadmap that we ignore at our peril. It’s not enough to read this book; we need to act on it, now! The winners in the analytics revolution won’t simply replace human decision-making, they will augment it. The essential guide to this management revolution is Davenport and Kirby’s remarkable new book. Individual knowledge workers, corporate executives, and government leaders all need to read this book. Smart machines are going to change our work and our lives, and the sooner we begin to augment their capabilities, the more successful our economy will be. 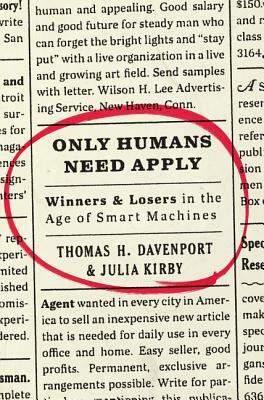 Davenport and Kirby are correct: people will augment these tools, rather than be automated by them. The sooner you learn about augmentation, the more successful you’ll be in the labor markets of the future.